c. Relate the role of technology and human intervention in the control of constructive and destructive processes. A seismograph is used to measure the movement of the ground during an earthquake. Scientists use the information provided by a seismograph to determine the severity of an earthquake. The Richter Scalescores earthquakes from 1 to 10 depending on the amount of movement that the earthquake causes. Every whole number on the scale represents the earthquake being ten times bigger. For example, a 5.0 on the Richter Scale is ten times bigger than an earthquake measuring 4.0. Scientists have recently begun using a newer, more specific scale to measure earthquakes called the Moment Magnitude Scale (MMS). 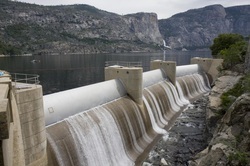 Dams help control the flow of water down major rivers. That flow of water is then turned into electricity. The Tennessee Valley Authority, which was created as part of FDR's New Deal, built many dams in the Southeastern U.S. They still are a major source of hydro-electric power today. You can explore their site to learn more about dams, hydro-electricity and flood prevention. Check out www.stopdisastersgame.org for a simulation on disaster prevention. You will be put in charge of a small town and will be given the task of trying to keep your town safe from a flood, hurricane, tsunami, earthquake or wild fire. You can also learn all about prevention techniques such as drainage systems and various types of levees. Levees are designed to control the flow of water. Unlike dams, they do not block a river. Instead they make the sides of the river taller to prevent flood damage to nearby cities, houses and businesses. To learn all about levees click on the levee simulator on the webpage linked here. To learn about the risk of flooding click here. To learn about the cost of flooding click on the simulation tool here. Heavy rainfall can also lead to large amounts of water running through the city's storm drain system. As more and more people live in cities, pollution becomes a bigger and bigger problem. You can learn more about storm water pollution here. To learn more about water and the water cycle click here. To learn more about watersheds, click here. Since, we are learning about water management you should be aware that 1.1 billion people do not have access to clean drinking water. Americans often do not realize how fortunate they are. Many scientists and aid organizations are searching for solutions to help. You can learn more about the world's water problem here. Beach reclamation is simply providing more sand for a beach that is eroding. I have linked a site that has a terrific explanation of dredging, which is a common method of beach reclamation. Beach reclamation is beneficial for land owners who own beachfront property, because nice beaches make their property more valuable. In addition it helps to keep beachfront buildings safer from erosion damage, but recent studies such as the CBS news video below, suggest that beach reclamation is a waste of money. According to the video beaches that have been nourished or reclaimed erode 2 to 12 times quicker than an ordinary beach. Beach replenishment is a constant issue. Linked here you will find an article outlining the damage done to beaches by Hurricane Sandy and the replenishment project that followed. —Man's activities, including channel dredging with offshore disposal of dredged material, jetty construction, shoreline structures, and damming of rivers. Georgia's coast islands and beaches are composed largely of sediment which has eroded from the highland and mountainous regions further inland. This first video is linked to a 30 minute video all about Georgia's coastal islands. The second video is a bit longer and goes into a bit more detail and gives the full history of Georgia's coastal islands. 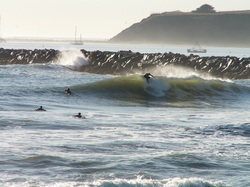 Jetties are long narrow barriers, often made of rock, which prevent waves from washing sand into harbors. They also prevent large waves from crashing in the harbor. In some places like Charleston, South Carolina, long jetties allow large ships to travel through long channels into Charleston Harbor.